This Tid Bit discusses how I cut out a disc of brass for the top of a clock weight. Sounds easy enough – eh, but, how to do it? Let’s see – I guess I could use a jewelers saw to cut out a disc, drill it in the center, mount the rough disc on a mandrel, and then spin it in the lathe to clean up the edges and cut it to exact size. For those of you who have ever used a jeweler’s saw, you know it is very satisfying; if indeed, rather slow work. OK. Show of hands – how many of you have ever used a shellac chuck (sometimes called a wax chuck)? Right, put your hands down – looked like around ten percent have used one. While I had never tried holding a flat piece of brass on a shellac chuck, it turned out to be a slick solution to my challenge. But to digress a bit. Shellac (or wax) chucks are typically used to hold very small parts that just can’t be readily held any other way. For instance, the escape wheel from a watch. By gently heating the shellac chuck while it is mounted in a lathe, and then applying a bit of shellac or wax to the face of the chuck, and continuing to gently heat with the flame from an alcohol lam you can soften the shellac, mount, and then center the work piece on the chuck. The centering part is done while the lathe is spinning and the shellac is just softened (judicious application of the alcohol flame to the brass arbor between the shellac chuck and the collet). Believe it or not, it is possible, just using your finger, to center a gear on a shellac chuck so perfectly that you can repivot a very small arbor, like the escape wheel of a wrist watch. But, that is not what I did in this instance. This time I was holding a 2.5 inch square of 0.023 inch thick brass so I could cut out a circle. But, before we get to the technical part, let’s spend a moment discussing safety. As you can see in the accompanying photos, we will be talking about doing a number of things that could hurt us. We will use heat to melt shellac, we will be spinning a square of metal in a jewelers lathe, and we will be generating fine metal shavings when we use the graver to true up the edges of the disc. While each of us has probably done such things a number of times before – it pays to take a minute and think through what could go wrong and what we should do to keep it from going wrong. Heat – each time you light the alcohol lamp, or the stove, think about what will be getting hot, and where the flame is. Especially with alcohol lamps, it is all too easy to not notice the virtually invisible flame – until you put your sleeve or arm into it. So, make a conscious effort to know where the flame is at all times. And, it also makes sense to extinguish the lamp when you get the work piece located on the chuck. Fortunately, the way I show mounting the brass to the plate keeps your fingers away from the flame, and from the heated brass sheet. Even when you pick up the collet to lift the plate off of the stove and place it on a towel, the collet will still be cool. None the less, wear safety glasses when working with the flame and the shellac. While it is unlikely that the shellac could pop or splatter, a little water in the shellac could cause steam and splattering. As shown in the pictures, I spun the square of brass plate on the lathe. This means there are sharp points spinning around which could readily cut you. As with the flame, you need to focus on where the risk is located, and consciously keep your hand, arm, and clothing away from it. If it makes you nervous, take a pair of tin snips and cut off the sharp corners, being careful to keep the deformation from the tin snip cuts away from the edge of what will be the finished disk. When you start cutting you will be generating fine shavings of brass. Be sure to be wearing safety glasses when cutting out the disc. Also take extra care when finishing the cut and parting off the square with the hole cut in the center. I found the actual separation point to be anticlimactic, but I was taking care to be extra observant and cautious as I approached that final cut. 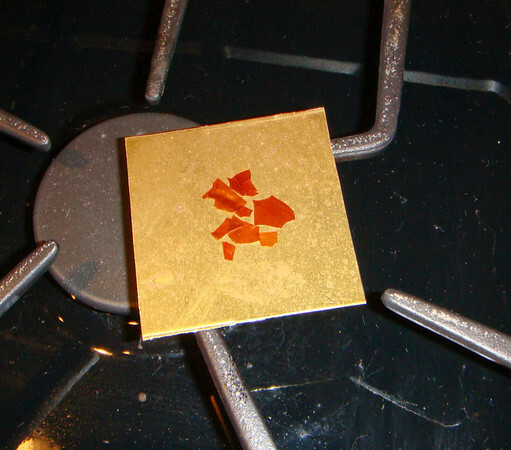 Figure 1 – Brass square ready to be heated. As you can see in the accompanying pictures, the first thing I did was melt some shellac flakes in the center of the brass square. I did this on my gas range. You can also do this readily on an electric range, with the heat turned down low. In as much as shellac softens around 150 to 160 degrees F, we are not talking a lot of heat. A ready supply of shellac flakes can be found at most woodworking stores. This is the same shellac that can be dissolved in alcohol and used as a wood finish.